Let's take a look at a rare book that was first published in 1991, last reprint in 2000. Tim Hildebrandt has a brother Greg Hildebrandt. They are known as The Brothers Hildebrandt, best known for their popular The Lord of the Rings illustrations and the first Star Wars movie poster was painted by them. 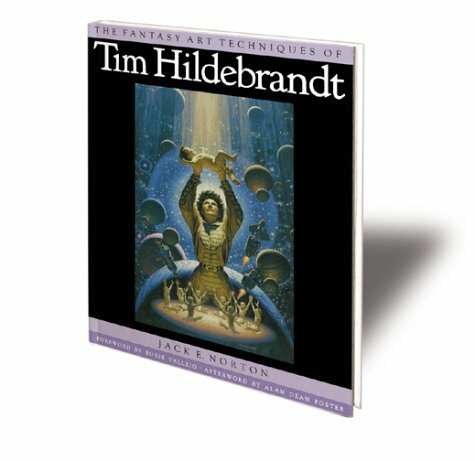 The book has a short biography on Tim Hildebrandt's life, how he got started in illustrations, his influences and resources. In Section (Chapter) Two, we look at his workflow when taking on assignments. For example in a book project, To come up with a concept or composition, he would read the whole book, and take notes on interesting scenes that would possibly make good compositions. This is not strictly a step-by-step tutorial book. However, it does provide lots of tips on techniques for creating illustrations, be it black and white or with colour. There are things like choosing pencils, where to put the light source, etc. The book ends off with strategies of presenting the art and the artist himself in business. It includes things like what to put inside portfolios, on the need for artist to have several styles, techniques and mediums. Most of the illustrations featured in the book are from the 70s and 80s. The style is definitely very different from those we see today, especially if we associate fantasy with futuristic fantasy. But all the illustrations are timeless in the way that they adopt strong artistic principles which will never age, like good composition and lighting. This book is hard to get. You might want to check out Amazon resellers.